How do Vietnamese universities rank on the world map? VietNamNet Bridge - The latest ranking announced by Webometrics shows that many Vietnamese universities have fallen from their previous positions. The second 2016 edition of university ranking released by Webometrics on July 29 does not show big changes compared with the first except the positions of Vietnamese universities. In the first edition, Vietnam National University Hanoi led Vietnamese schools and was ranked 26th in the region (South East Asia). Meanwhile, in the second edition, it ranks 29th,. Can Tho University has fallen to 53rd from 39th. The Hanoi University of Technology, the most prestigious polytechnic school in Vietnam, is ranked 49th instead of 47th. The latest ranking announced by Webometrics shows that many Vietnamese universities have fallen from their previous positions. There are some changes with positions in the top 10. The Vietnam National University of Agriculture, which was not listed among top 10 in the previous ranking, is in the fourth position among Vietnamese schools and 69th in the region. 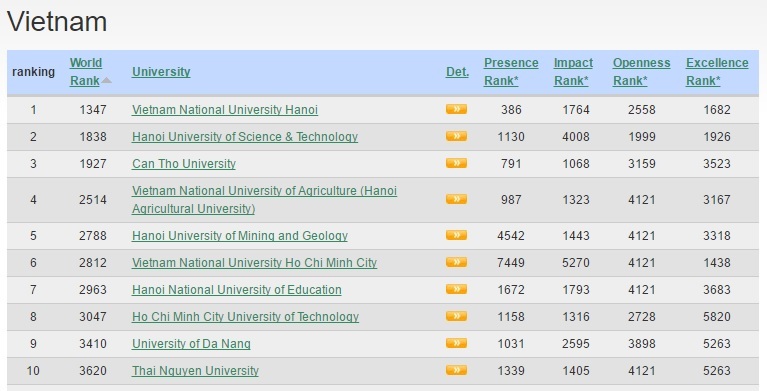 The Hanoi University of Mining and Geology ranks fifth in Vietnam and 83rd in South East Asia. The other prestigious schools include Hanoi University of Education, Vietnam National University HCMC, HCMC University of Technology, Da Nang University and Thai Nguyen University still can be found among Vietnam’s top 10, but their grades have fallen in the region’s ranking. The Vietnam National University HCMC, for example, has fallen from the 66th position to 87th. Meanwhile, the Hanoi University of Education fell from 60th to 90th. Pham Thi Ly, director of the Research Program under the Vietnam National University HCMC’s International Education Institute, said there was no need to be too worried about the grade falling. She said Webometrics’ ranking can only show which schools have websites with more page views, and this does not directly relate to the quality of schools. Nguyen Van Nha, former president of the Nguyen Trai University, noted that the rankings by international organizations were objective and unbiased, based on automatic information analyses. However, every organization sets its own requirements when accrediting universities and the requirements may be different from the criteria and management methods applied in Vietnam. However, he emphasized that Vietnam, which has been integrating more deeply into the world, have to accept the rankings and refer to the rankings to improve themselves. QS University Rankings Asia in June 2016 released the report on top 500 Asian universities, which included five Vietnamese schools. These included Vietnam National University Hanoi (139th), HCMC National University (147th), Can Tho University (between 251st-300th), while the Hanoi University of Technology and Hue University were between the 301st and 350th.